What criteria do you use to determine which heifers you'll keep for replacements? Rick Funston, a beef reproductive physiology specialist with the University of Nebraska-Lincoln has a checklist he likes to keep handy. Funston credits University of Nebraska emeritus professor of animal science Jim Gosey with initially developing this list of selection criteria and says it's a good tool for producers to use in their decision-making. Based at the West Central Research and Extension Center in North Platte, Funston is widely known for his fetal programming research and says many of these selection tips relate back to the cow. Tip 1 — Cull daughters of problem cows. Funston explains this includes cows that needed help calving, were late calving or that have bad dispositions. Tip 2 — Cull lightweights, big birth weights and 6-frame heifers. He tempers this by saying big doesn't always mean bad. He explains, "If she's big because she is older, you may want to keep her." Tip 3 — Along with that, Funston says you want to select heifers that were born during the first 45 days of the calving season. "Cull the youngest heifers," he recommends. Tip 4 - Select daughters out of the oldest cows. This goes back to information that is being learned about fetal programming and the fertility in those cow lines. Funston explains that cows that offer longevity will most likely produce heifers that also offer optimum pregnancy rates. 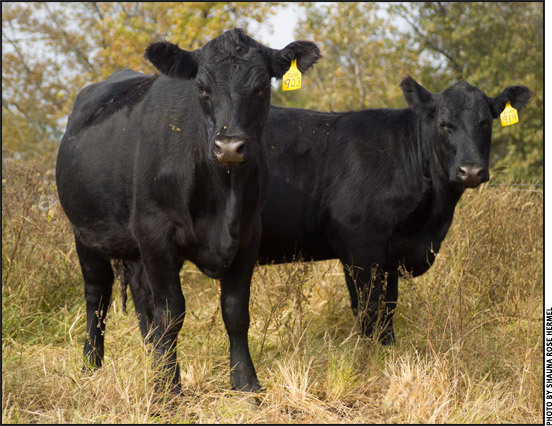 Tip 5 — If you are in a commercial setting with baldies, select heifers that have pigmented eyes and udders. Tip 6 — Go for depth of rib. Funston emphasizes selecting heifers that offer volume and chest width, which results in cows that have the capacity to eat a large volume of low-quality forage.